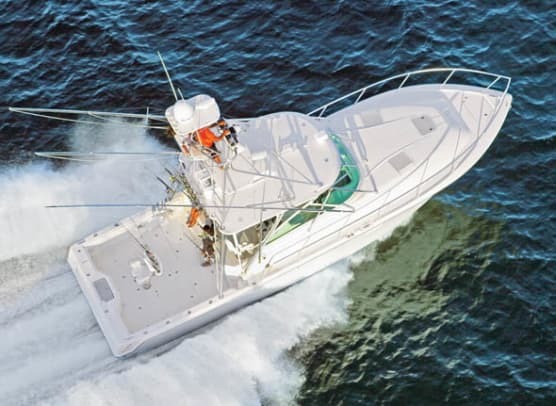 This customizable fishboat is fast, versatile, and very maneuverable. I’m a show-off of sorts, truth to tell. 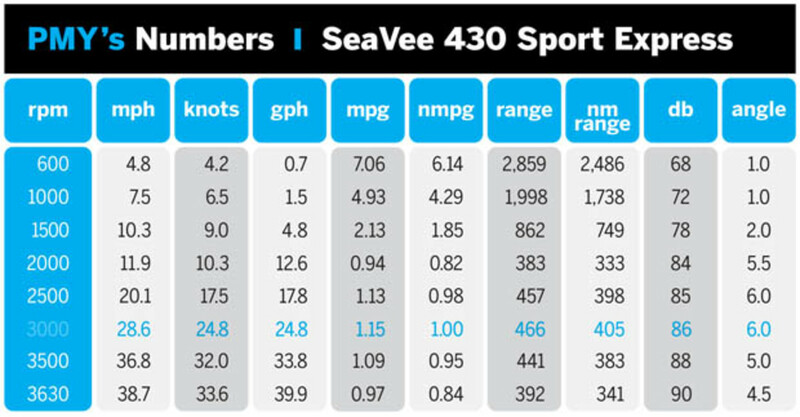 And recently, on a warm, sunny morning in Miami, as I sauntered across the parking lot of Grove Harbor Marina en route to my test boat du jour, SeaVee’s 430 Sport Express, I noticed a certain verve holding sway, almost a sure sign of a few boathandling theatrics to come. 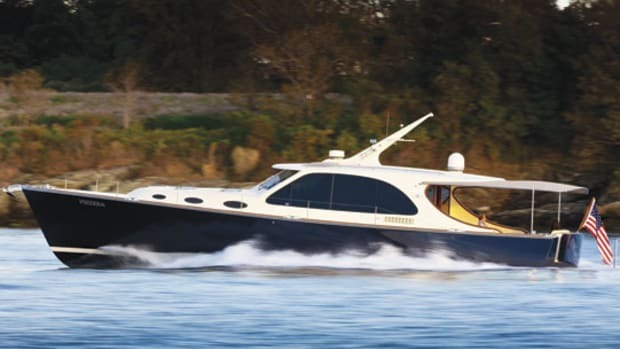 After all, I was already aware I’d be sea trialing a pod-drive version of the 430 (there are inboard and outboard versions as well) with Volvo Penta IPS600s. 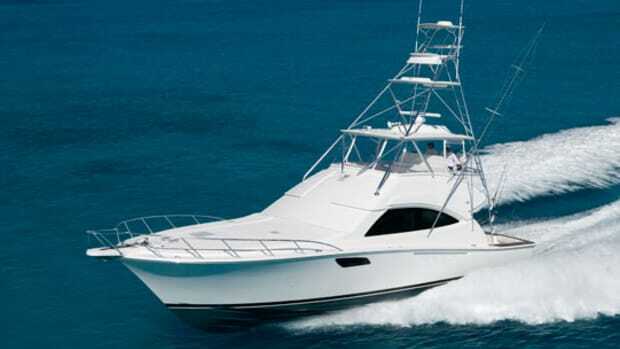 And, over the years, I’ve gotten pretty good at handling this type of boat dockside, if I do say so myself. Over the years I’ve learned that checking out an engine room before the sea trial keeps the sweat factor to a minimum. So, with the flip of a switch, I raised the 430’s bridge deck via electro-hydraulic actuators thereby revealing a relatively cool, elbow-roomy ER beneath with centrally located mains and, outboard of them, a couple of fuel tanks fabricated of epoxy-coated welded aluminum, reportedly 1/4" thick. 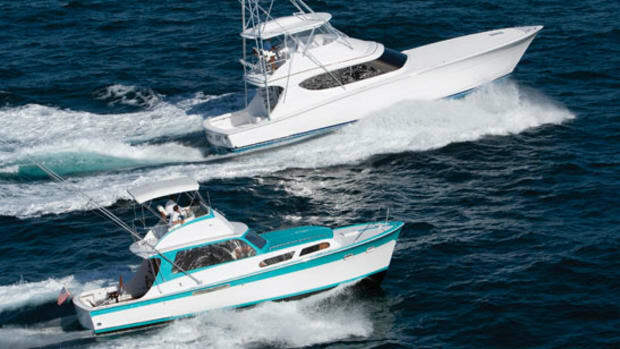 According to Pared, SeaVee positions the 430’s diesels (connected to pods by jackshafts that run astern under the cockpit) and fuel tanks over the Longitudinal Center of Gravity (LCG) to guarantee balanced performance at speed and nix trim issues related to various stages of loading. Engineering was tops, for the most part. Electrics were chased, tie-wrapped, and labeled with artisanal care. Engine mounts were massively secured on steel beams atop robust fiberglass engine bearers. A Glendinning Cablemaster (with RF antenna for remote operation) was to starboard, against the forward firewall, and the general appearance of the place was clean and uncluttered. This latter feature was in large part because many of the boat’s ancillaries (air-conditioning units, sanitary system, etc.) were in an under-sole “machinery room” up forward beyond the steering console. I had only two complaints. The first stemmed from the way the soundshield-enclosed genset had been installed—in a small, cramped, maintenance-resistant compartment under a cockpit hatch. The Racor for the genset looked particularly hard to get at. 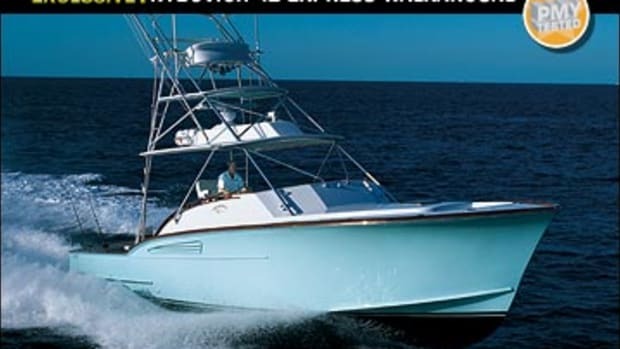 And the second had to do with the condensate I’d noted on the port side of the trunk cabin’s roof when I’d first looked the boat over a few months before during the Fort Lauderdale boat show. While Pared theorized that excessive heat and humidity had caused the phenomenon, I’d suggest adding insulation to the air-conditioning ductwork laying against the underside of the cabin’s roof, inside the boat. “How about a ride?” I inquired, once Pared and I had toured the interior. It’s a carefully finished place, with one head and one stateroom. There’s a convertible lounge/dinette with privacy curtain in the saloon area. 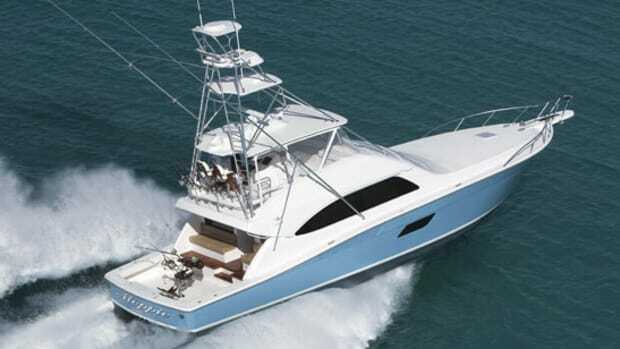 The master, on the port side aft, has a big comfortable 54" x 81" berth, and the galley sports a couple of Vitrifrigo refrigerator/freezer drawers, an Elkay faucet, granite countertops, and an optional pull-out drawer-type Kenyon induction stove. 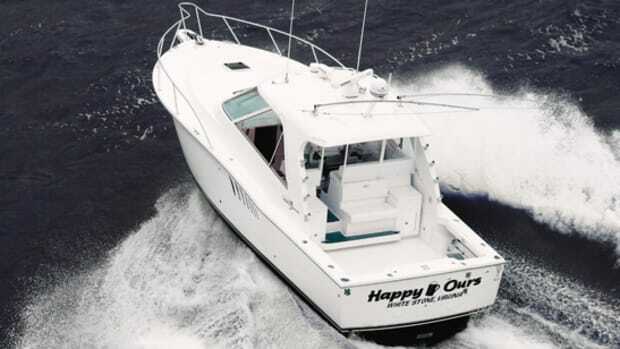 In less time than it takes to wolf down a plate of Bahamian conch fritters, I was sitting behind the 430’s Edson steering wheel with the mains fired up, using the fingertips of my right hand to test both the Volvo binnacle engine control to starboard and the Volvo joystick just abaft it. The lines stretched with responsive immediacy every time I bumped the mains into gear. Then, after Pared had cut us loose from the dock, I began walking the boat to port, well into the fairway, with a sense of anticipation. Yeehaw! Using the joystick, I spun the boat speedily around in a complete circle within her own length. Then, with even more speed, I spun her again. My next move entailed zooming backwards across the fairway toward the channel, followed by a similar maneuver, only this time going away from the channel. Then finally, I almost returned us to our slip, walking the 430 to starboard with show-offy exuberance but stopping her abruptly at a distance off of a measly four inches. “Now that was cool!” I exclaimed, before walking the vessel back into the fairway for the run offshore. Conditions at sea were mellifluous, with waves widely spaced and cresting at three feet or less. The average top speed I recorded was 38.7 mph, speedy but a little low perhaps, given the over-spec, seemingly under-propped revs we were getting at that velocity. Visibility over the bow was good throughout the rpm register once I’d employed the EVC trim tabs. Sound levels were a bit high, particularly toward top end, most likely because our engines were almost directly below the helm station, and the switches and instruments on the dash were sensibly laid out. Just one aspect of open-water handling needed improvement, in my opinion. 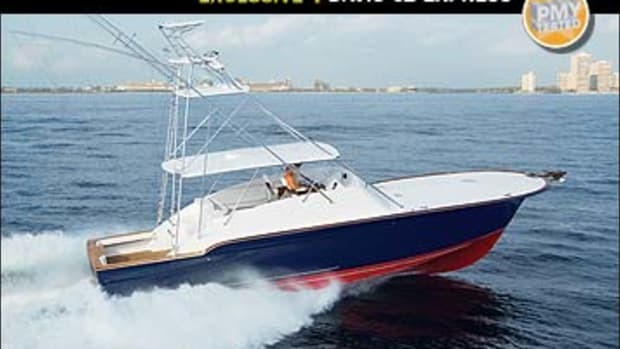 Hardover turns seemed extremely tight, thereby engendering considerable inboard lean, a characteristic that might be partly attributable to the comparative narrowness of the 430’s hull (some models from competing manufacturers are beamier by as much as two feet) and the tower’s added top-hamper weight. I’d suggest modifying the IPS software to slightly reduce the turning radius of the IPS drive units, at least on models equipped with towers. 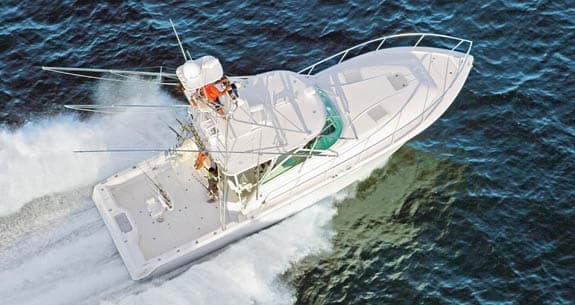 Serious piscatorial pizazz was showcased in the final minutes of the sea trial. 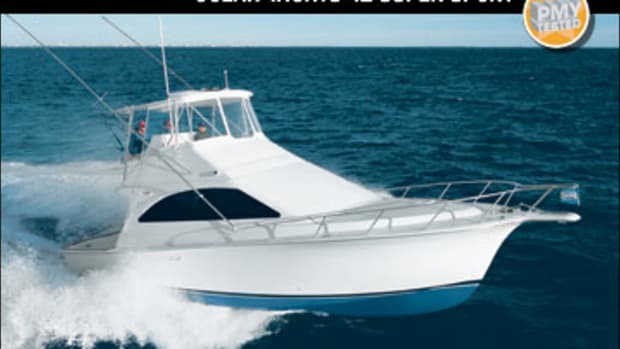 Out near Biscayne Channel Light, a popular baitfishing spot, I engaged the optional Dynamic Positioning System, and we held station and heading almost as if we were aground. 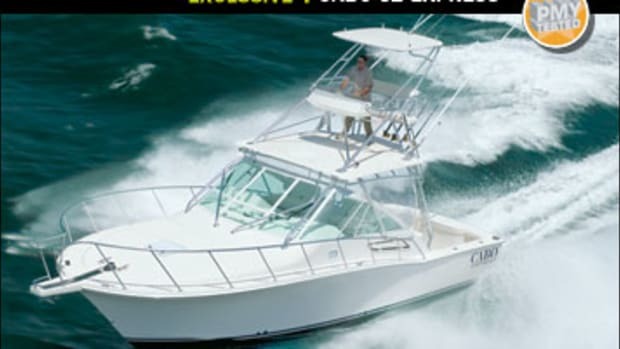 And then I engaged the Volvo Sportfish Mode and simulated a fish-chasing backdown that was so responsive, so agile, and so knock-your-socks-off exciting that I have no trouble coming to this conclusion: SeaVee’s IPS version of its 430 Sport Express is not only fast, customizable, and show-off-friendly dockside, she’s even more show-off-friendly when you back her down on a fish.